This Thanksgiving, replace that high-sugar cranberry sauce from the can with freshly cooked cranberries, apples, and lemon zest! Plus more healthy Thanksgiving sides! This relish will taste yummy on turkey, sandwiches, and salads! 2. 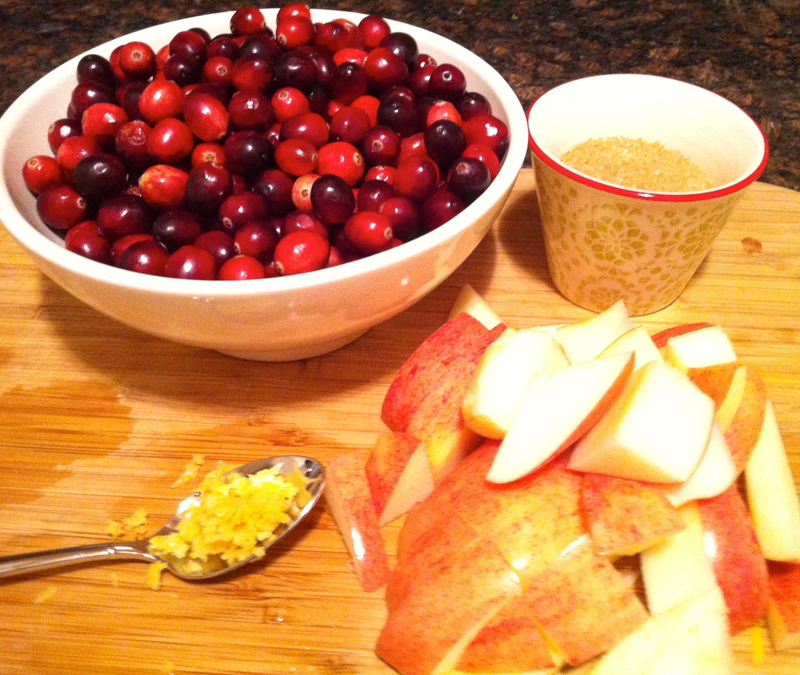 Add cranberries, apples, sugar, and orange juice in a skillet or saucepan on medium heat. Bring to a boil. 3. Reduce heat and simmer for 10 to 15 minutes until consistency is thick, almost like Jello. 4. Use a potato masher or fork to mash cranberries and apples. 5. Serve hot or chilled. In a large skillet, add carrots, garlic, and salt in a single layer and cover with water. Bring to boil. Once the water starts boiling, turn heat to low cook for about 10 minutes (carrots will be soft, but will still have a little crunch). Drain carrots and garlic, then put them aside. Clean pan. Place pan back on medium-high heat. Once hot (but not smoking), add oil, honey, chili, rosemary and 1 tablespoon of water and cook until it starts to bubble. Stir in carrots and garlic until coated and slightly browned, about 5 minutes. Serve warm or room temperature. Antioxidants are naturally occurring chemical substances that help cells deal with environmental stress and damage. Why scrub instead of peel carrots? Most of the carrot’s nutrients (the good stuff) are in the peel. By scrubbing carrots with a vegetable brush you only remove dirt and keep all the good stuff in the peel. 1. Heat oil in pan. Add diced shallots and garlic. Cook for about 5 minutes until translucent. 2. Add butternut squash and about 1/2 – 1 cup water. Cook about 15 minutes, until tender. Add cumin. 4. Add kale. Cook 3 minutes, just until wilted. Want to make sure you are getting all the essential vitamins and nutrients? Eat the Rainbow! Orange: Vitamin A derivative and antioxidant beta-carotene, essential for healthy eyes. Green: Folate, Iron, and Vitamin K, essential for heart and circulatory health. Iron absorption is enhanced by the Vitamin C content of the fresh lime juice. White: Quercetin, an antioxidant may aid in maintaining a healthy blood pressure, and natural antimicrobial agents abound in garlic, essential for a healthy immune system. Red: Lycopene is plentiful in red fruits and is essential for a healthy heart. Blue/Purple: Anthocyanins and even more antioxidants are found in blue and purple fruits and vegetables and are vital for the basic health of all cells in the body. Omega-3 fatty acids are good for you fats that are found in olive oil, flax seed, and cold water fish like salmon. Omega-3’s are important for healthy brain cells and heart cells. 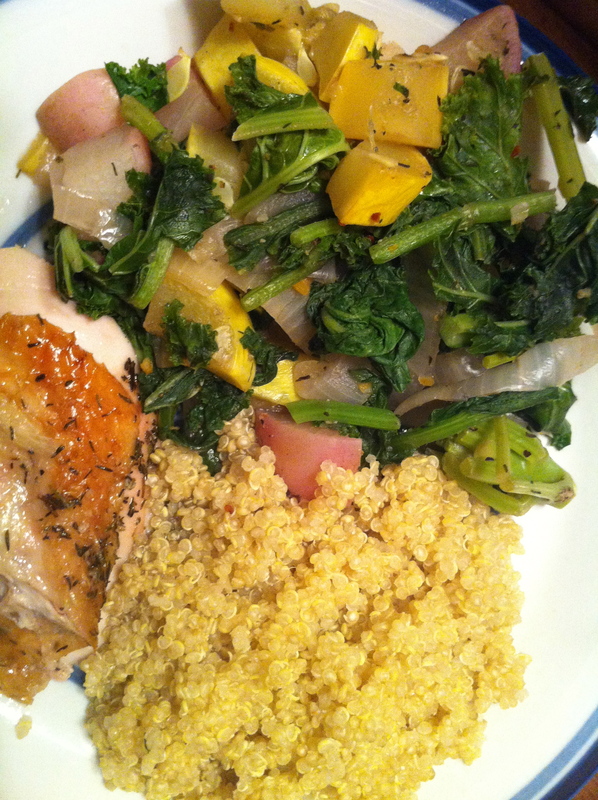 Cook4Health Demo Recap: Healthy Thanksgiving! 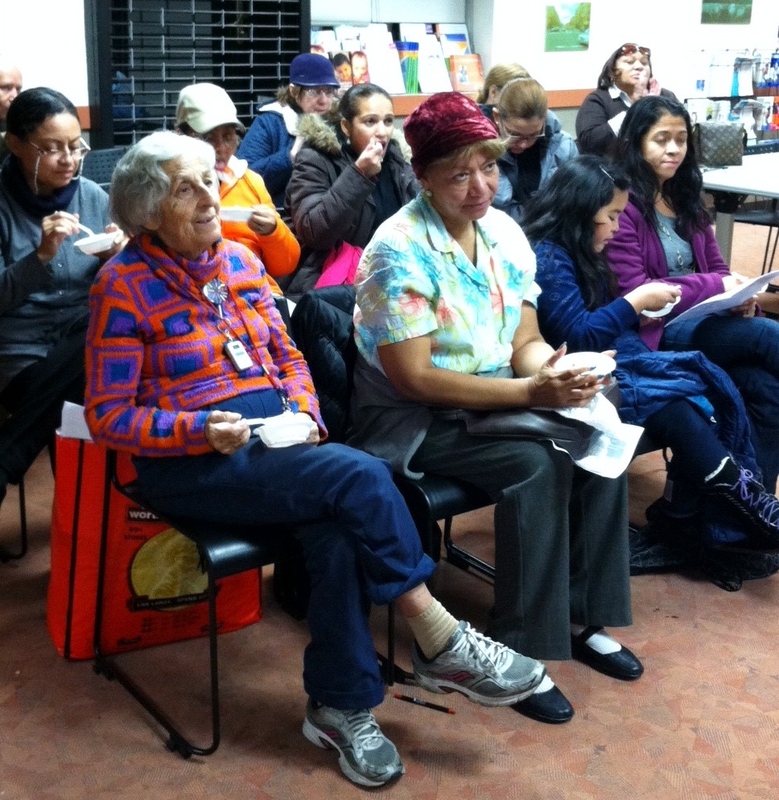 Thanks to Lisa and Anabel for another great Cook4Health Demo at the Columbia Community Partnership for Health! Participants learned how to make fresh cranberry sauce from scratch and a healthy carrot side dish to spruce up their Thanksgiving celebrations! Be sure to save the date for our next Cook4Health Demo on December 20th! Looking for a new whole grain to try? Check out red quinoa. Red quinoa has a slightly nutty flavor and is a great alternative to couscous, white or brown rice. Quinoa has the highest protein content (12-18%) of any whole grain and is also a good source of fiber and magnesium. 1. Cook quinoa in rice cooker. 2 ¼ cups water to 1 cup quinoa. 2. Heat olive oil in pan. Add celery and pepper. Cook 2-3 minutes. 3. Add summer squash. Cook ~5 minutes. 4. Add greens, let wilt about 1 minute. 6. 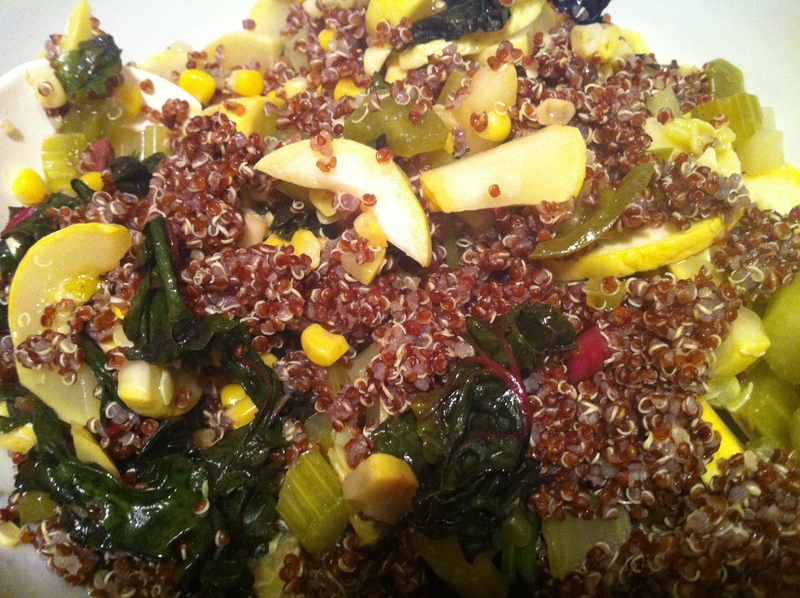 Mix with cooked red quinoa and added chopped walnuts. This is a great dish to bring as a brown bag lunch. When classes and school get really hectic, I’ll make this on a Sunday and freeze a few Tupperware containers of this for later in the week or the following week. One easy way to track your intake of vitamins and minerals is to eat all the colors of the rainbow. Ideally you should aim for five servings of fruits and veggies in one day and you should consume multiple servings from each “color category” weekly. This recipe features veggies found in your CSA box and is a great source of folic acid, vitamin C, beta carotene, vitamin A, and vitamin K.
Leafy greens: kale, spinach, collard greens, lettuce, arugula, etc. 1. Thoroughly wash all vegetables. 2. Chop onions and radishes. Saute the onions and radishes for 5-10 minutes, until tender. If using dried thyme, add now. Add small amounts of water as necessary. 3. 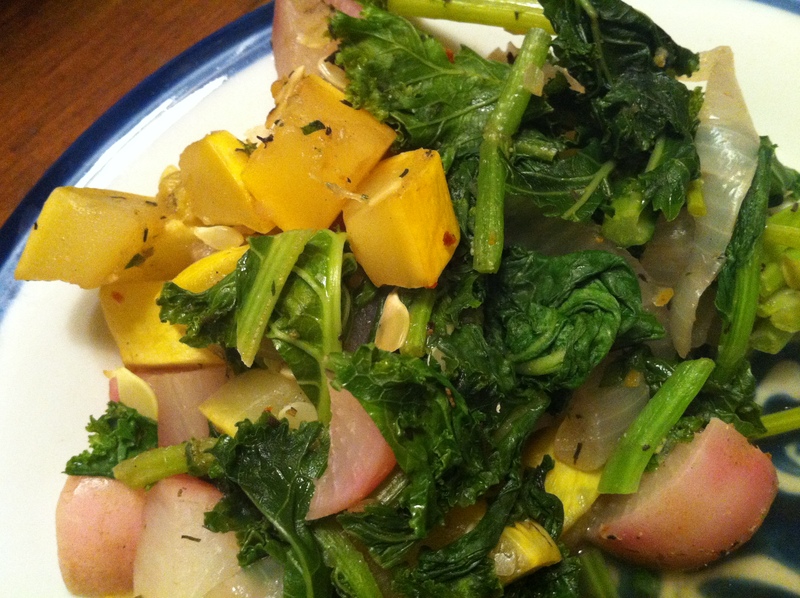 Chop squash and kale. Add squash and kale stems to pan. Add water as necessary. 4. 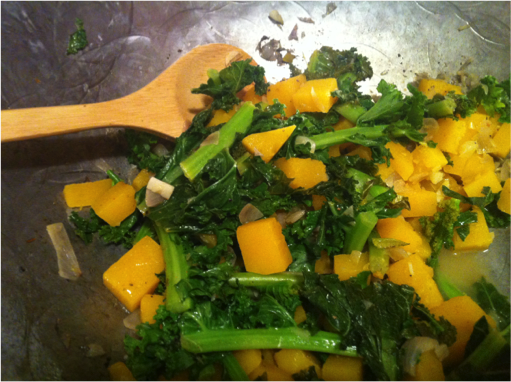 When squash and kale stems are tender and everything is almost cooked, add kale leaves to the pan. If using fresh kale add now. Allow kale to slightly wilt. Remove from heat. 5. Add ½ – 1 tbsp extra virgin olive oil. Season with freshly ground sea salt and black pepper to taste. Protein: Baked Chicken with Thyme. 1. Place in baking dish. Slice skin and rub salt and thyme onto bird. Rub just a dash of lemon onto the bird. This helps the flavoring penetrate to the meat. 2. Bake at °450 F for 50 minutes to an hour, depending on size of chicken. *Tip: For a leaner protein, discard skin. I like to do this after cooking. 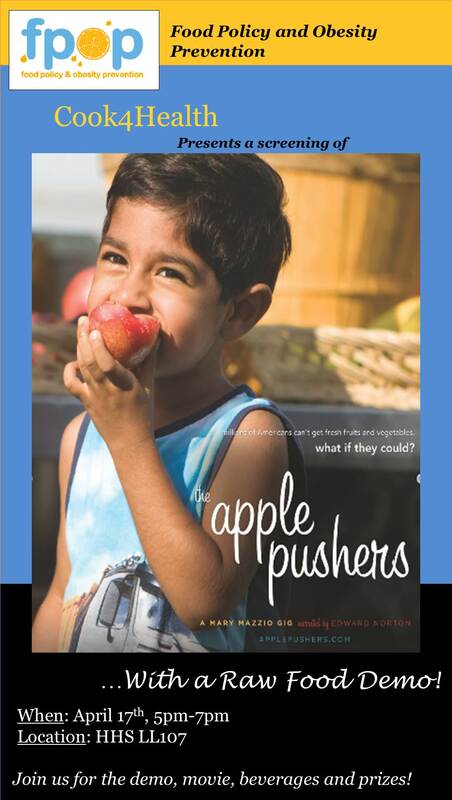 April 17th – FPOP’s 3rd Cook 4 Health Food Demo and the CUMC Premiere of “Apple Pushers”! Myths abound with respect to the benefits of eating a “raw food” diet, but I think we can all agree that at the heart of any raw meal is some really delicious produce. Cue the NYC Green Cart Program, established in 2008 to provide start-up support for local vendors who wish to sell fresh fruits and vegetables in neighborhoods across New York City. FPOP thought this would be an excellent opportunity to showcase the fruits of their labor. On April 17th, 2012, our Cook 4 Health team will prepare a raw food dish for the audience (along with a discussion about the good and the bad of raw food), to be followed by a screening of “Apple Pushers,” an award-winning documentary about the immigrant street vendors rolling fresh produce into some of NYC’s poorest neighborhoods. Refreshments will be provided, along with tasters from the cooking demo (think zucchini spirals in a creamy cashew sauce and mango pico de gallo). Three lucky attendees will win a prize related to the demo! We hope to see you there! 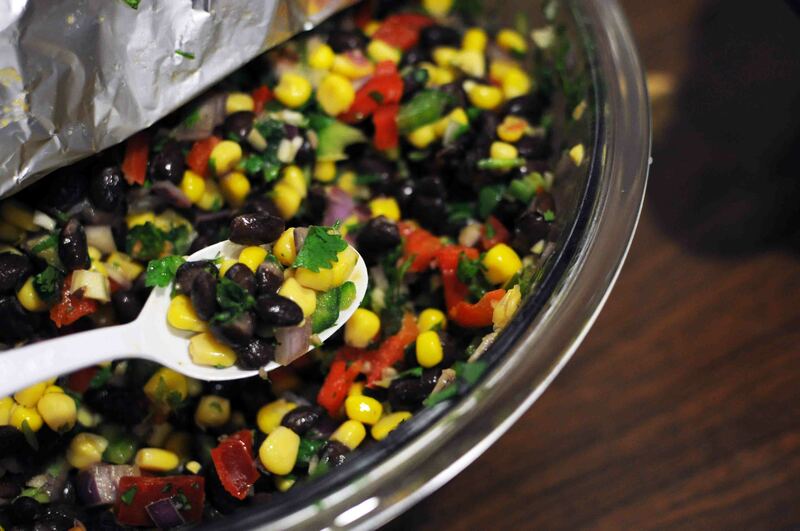 In celebration of Food Day, FPOP hosted a cooking demo on October 25th in the Hammer Health Sciences Library. Using ingredients purchased at the Farmer’s market outside of Hammer, we cooked up three rounds of Zesty Butternut Squash with Greens. We distributed over one hundred fifty recipes to interested students and had a great dialogue about cooking and nutrition with many members of our audience. 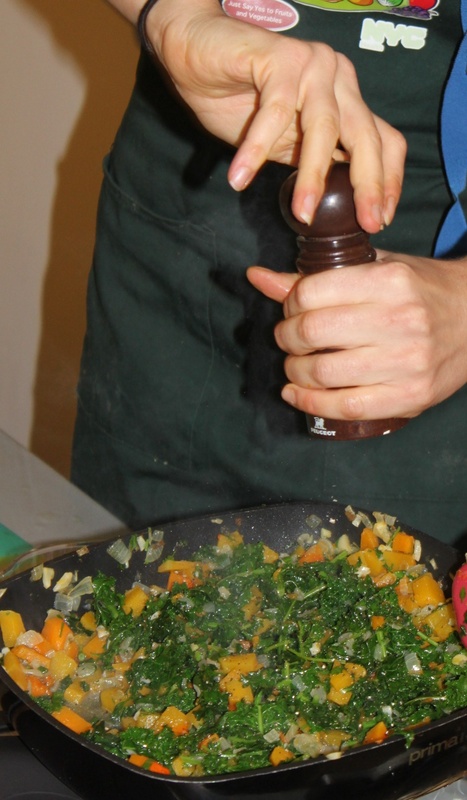 This cooking demo is part of the Cook4Health series initiated by FPOP last year. We will also conduct Cook4Health seminars targeted at physicians and medical students in addition to more Cook4Health demos for the general student audience. Thank you to everyone who stopped by our demo, thank you for helping to make our event a success! We look forward to seeing you there next time as we cook up more locally sourced, healthful, tasty dishes! 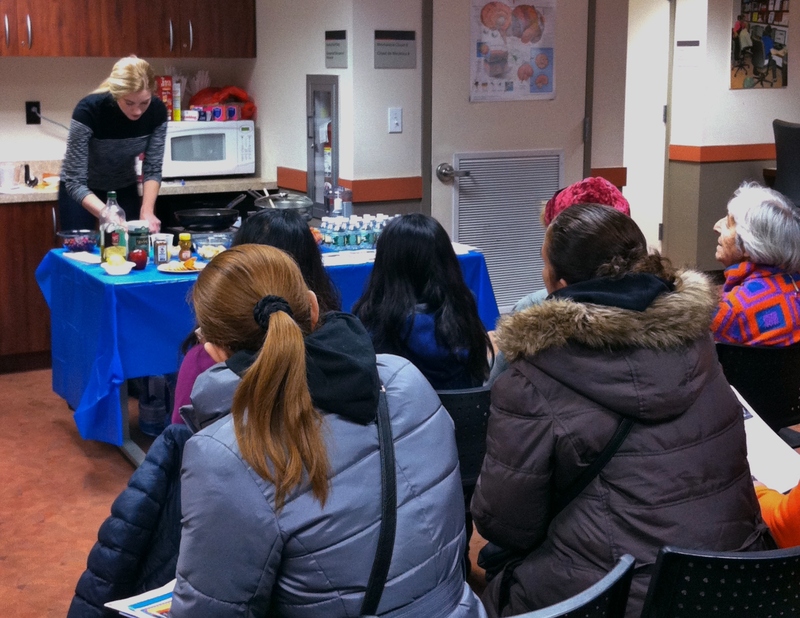 FPOP held the pilot session of our Cook4Health initiative to teach medical providers about food and cooking. Doctors know surprisingly little about food and nutrition, which is a hindrance to their ability to treat the consequences of food-related disease. In order to address that, we are rolling out cooking workshops so that doctors can establish a dialogue with their patients about eating and cooking practices. In order to address this deficit, we decided to go to young future doctors and give them some basic information and cooking tips, so that they could walk the talk and feel comfortable discussing food with their patients. In order for the doctors to preach, we wanted to show them that they really could create delicious, healthy dishes that were very affordable. We held the first workshop last Thursday and I’m proud to say it was a resounding success. 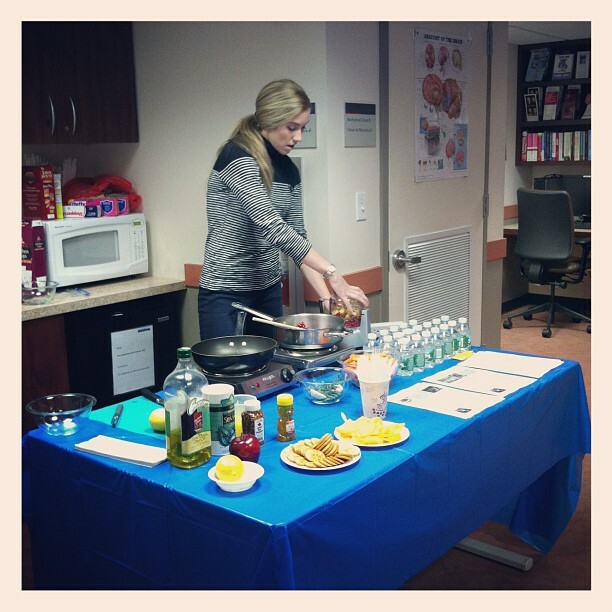 The doctors were incredibly engaged in the material and were truly interested in learning about the benefits of foods. Importantly, we insisted on focusing not just on nutrients (beta-carotene, for example), but on foods (carrots!). We also created dishes based on culturally-appropriate foods their patients already use. In this case, working with doctors who practice family medicine in Washington Heights, we chose ingredients and flavors that would be familiar to the Dominican population: corn, beans, yucca, sweet potatoes, lime, cilantro. The direct aim of this program is to get doctors to feel comfortable talking to their patients about food — even using cooking practices as a “vital sign,” for example, since it’s very difficult to eat healthily on a low-income budget if you don’t cook. The larger, indirect aim is to cultivate a sense of responsibility in the medical community for helping shape the food environment. Doctors have a notoriously large voice in shaping public opinion and public policy. If they become advocates for changes in our food system, we are much more likely to achieve the large-scale environmental change we need to ensure that the default choice is not the unhealthiest choice.